The Lodge portable "camp stove" is the pot that does it all. 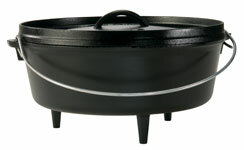 The flanged lid holds hot coals and inverts for use as a griddle. The integral legs allow the oven to sit perfectly over hot coals. Includes Camp Dutch Oven Cooking 101 book. 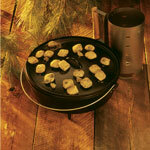 Like whiskey and tall tales, Lodge Cast Iron improved with age. There are few companies who can boast that products they made over 100 years ago remain in use today, and are still in high demand. You just won't find anyone who knows camp oven cooking like Lodge. Our camp ovens have proven themselves with avid outdoorsmen and patio pioneers from Tennessee to Tokyo. When you create a meal in Lodge Cast Iron, you create a memory that lasts a lifetime. The right tool for searing, sauteing, simmering, braising, baking, roasting, and frying. Seasoned for a natural, easy-release finish that improves with use. Seasoning is a necessary step in using cast iron cookware. Oil is baked into the pores of the iron at the foundry to prevent rusting and to eventually provide a natural, non-stick cooking surface. Unlike synthetically coated cookware, it is possible to restore the cooking surface of cast iron. If for some reason your utensil develops a metallic smell or taste, or perhaps rust spots (maybe a well-meaning relative washed your utensil in the dishwasher or with soap thinking they were being helpful), never fear. Simply scour off the rust using a very fine grade of sandpaper or steel wool and refer to our section on re-seasoning. Set oven temperature to 350 � 400 degrees F.
Why should I choose Lodge cookware over other brands? 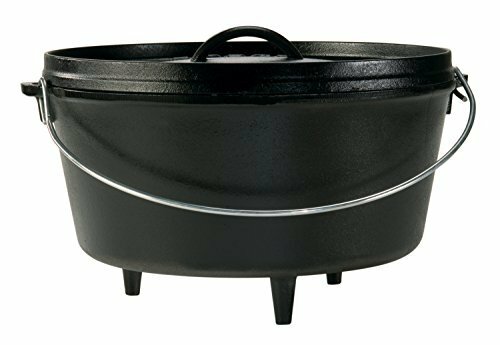 For over 112 years, Lodge has provided quality cast iron cookware and accessories, with a broad and innovative assortment. Our continued commitment to quality enables Lodge to offer a superior product line. How is the diameter measurement of Lodge Cookware determined? We measure from outside rim to outside rim across the top of the cookware, not the bottom. What type utensils are recommended to be used with Lodge products? We recommend using wood or silicone utensils to avoid scratching. Why should soap or detergent not be used to clean cast iron cookware? Soap and detergent are used to break down and remove oils. Since the seasoning of your cast iron consists of oil, cleaning with soap will strip or remove the seasoning from cookware. 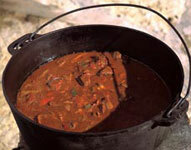 Are there any types of food that are not recommended to be cooked in cast iron cookware? Foods which are very acidic (i.e. beans, tomatoes, citrus juices, etc.) should not be cooked in a cast iron utensil until the cookware is highly seasoned. The high acidity of these foods will strip the seasoning and result in discoloration and metallic tasting food. Wait until cast iron is better seasoned to cook these types of foods. Lodge is the oldest family-owned cookware foundry in America. Since 1896, the Lodge family has been casting premium iron cookware at their Tennessee foundry. Starting with raw materials and finishing with their seasoning process, they continue to improve on the highest quality standards that go into every piece we make. As the sole American manufacturer of cast iron cookware, they are proud to carry on the legacy started by founder Joseph Lodge. Lodge doesn't just make cast iron; they make heirlooms that bring people together for generations.